There are other strategies, methods, and models for evaluating the influence of training and instructional experiences of any form beyond the Kirkpatrick Model, CIPP Model, and Success Case Method. However, an awareness of these three will provide you with a solid foundation for understanding the importance of evaluation of instructional programs, particularly workforce training programs, which are often the focus of an instructional designer’s role in an organization. These three models are discussed in brief in this post. Many sources of information about the Kirkpatrick Four Levels Model can be found online, including the website overview about the model from the Kirkpatrick Partners (2015) website where The Kirkpatrick Model is explained. I would argue that, just as the ADDIE Model for instructional design has components that are the essence of nearly every other instructional design model, the levels of the Kirkpatrick Model tend to appear in some form in other evaluation models as well. It is likely for this reason that the ADDIE Model and Kirkpatrick Model continue to widely utilized. Although the Kirkpatrick Model, developed by Donald Kirkpatrick in the 1950s, is one of the oldest formal training and instruction evaluation models and widely used even today, it is not the only model in existence. In fact, as you can learn about from the Kirkpatrick Partners (2015) website, there is a revised version of the standard four level model by Kirkpatrick called the New World Kirkpatrick Model, which may be of interest to you to explore. For a review of alternative models not developed by Donald Kirkpatrick, start by considering the blog post about Alternatives to Kirkpatrick from Bozarth (2009) and consider the brief overview of these alternative models provided below to ensure you are familiar with some of the available options, the CIPP Evaluation Model and the Success Case Method. Keep in mind that you may work for an organization that uses a combination of the Kirkpatrick Model and other models and that is quite typical as each organization tends to develop a unique culture of evaluation to suit its needs. The CIPP Evaluation Model was developed by Daniel Stufflebeam in the 1960s. 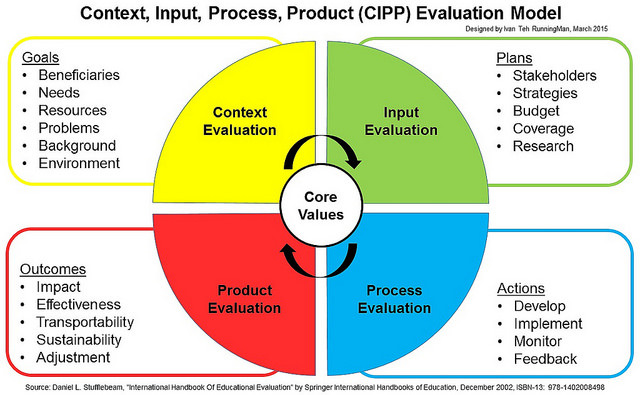 CIPP is an acronym for Context, Inputs, Process, and Product. These four components of the CIPP Evaluation model are designed to provide a holistic view of the success of instructional initiatives. While the Kirkpatrick Model is a reaction and review oriented model, the CIPP Model seeks to provide a more decision-based approach to evaluation. A summary can be read from Ivan Teh’s (2015) blog in the post where the following image and a research-based exploration of the CIPP Evaluation Model are provided. As Bozarth (2009) noted, the CIPP Model is more about evaluating what is being done during design and implementation than an evaluation of what has been done (para. 4). Mazur (2013) offers a another research-based summary of the CIPP Evaluation Model that is a good review to see for learning about how the model is a useful addition to or complete alternative to the Kirkpatrick Model. Another alternative to or addition to the Kirkpatrick Model is the Success Case Method. For a comprehensive introduction to the Success Case Method, refer to the Brinkerhoff (2009) excerpt of Chapter 1, which is freely available online as a PDF. Comparison of Kirkpatrick Based Models and the Success Case M (Gram, 2011). For a comparison of the Kirkpatrick-style model’s and the Success Case Method, refer to the image here from Gram (2011) – click the image to view at full size. As explained in the Brinkerhoff Chapter 1, the Success Case Method provides a sort of rapid-evaluation method that can help to bring focus to a learning initiative while more comprehensive models, such as the CIPP and Kirkpatrick Models, are used for longitudinal analysis of the effectiveness of instruction. Brinkerhoff (2009) also explains that the “Success Case Method combines the ancient craft of storytelling with the more current evaluation approaches of naturalistic inquiry and case study” (p. 17). For this reason, the method appeals to many who prefer a deeper focus on qualitative data in an evaluation method (i.e., model) for approaching a determination of the return on investment (ROI) for a performance change initiative. Remember that instruction is inherently focus on changing performance through increased, reinforced, or revised learning of knowledge and skills. Kirkpatrick, J. (2007, August). The hidden power of Kirkpatrick’s four levels. Training and Development, 61(8), 34-37. This entry was posted in Educational, Scholarship and tagged CIPP Model, evaluation models, Instructional Design, Kirkpatrick Evaluation Model, Success Case Method by Lisa Johnson, Ph.D.. Bookmark the permalink. topic. You understand a whole lot its almost hard to argue wioth you (not that I really would want to…HaHa). This is an excellent article. I am a student and working on my project and I have chosen to adapt the CIPP Model. I am convinced and I prefer its being holistic. Thank you so much for this wonderful scholarly article, Dr. Johnson!